ATLANTA—A new report reveals that 14 percent of 13 to 15-year-old students around the world currently smoke cigarettes. In addition, the report found that nearly 25 percent of students who smoke tried their first cigarette by the age of 10 and that most young smokers want to quit. The report, produced by the Centers for Disease Control and Prevention (CDC), the World Health Organization (WHO), the Canadian Public Health Association (CPHA), and the National Cancer Institute (NCI) also shows that exposure to secondhand smoke was extremely high in all countries. The report, which summarizes the findings of the Global Youth Tobacco Survey (GYTS), presents cross-country comparisons of tobacco use for 13 to15-year-old students from 75 sites in 43 different countries and the Gaza Strip/West Bank region. The GYTS is the largest school-based youth public health surveillance system in the world. It is the first surveillance system to successfully monitor youth tobacco use globally. By the end of 2002, 142 of the 191 member states of the World Health Assembly will be active in GYTS. The GYTS is one of many initiatives the CDC has undertaken to expand the capacity of countries around the world address the problem of youth tobacco use. CDC staff assigned to WHO regional offices in Africa and the Western Pacific is providing direct assistance to countries in those regions, work that is in part focused on preventing youth from taking up smoking. Additionally, CDC works in with numerous international organizations to provide skill-building workshops to help other nations establish and maintain effective youth tobacco control programs. The GYTS found that the highest rates of student cigarette smoking are in developing countries. More than one-third of students were current smokers in four countries (Chile, the Russian Federation, Ukraine, and Northern Mariana Islands.) In no country was cigarette smoking zero percent, which is the goal of tobacco control programs. Ten million people are expected to die each year from smoking-related illnesses by the year 2030. Over 70 percent of these deaths will occur in third world countries. Cigarette smoking among students in the United States was 17.7 percent, which was above the global median of 13.9 percent. Of major concern is the fact that so many young people around the world are exposed to cigarette smoking in their homes and in public places. Nearly half the students reported that they were exposed to secondhand smoke from others in their home. Students in Meghalay, India, had the highest exposure in the home at 79.8 percent. Overall, 60 percent of students were exposed to secondhand smoke in public areas. 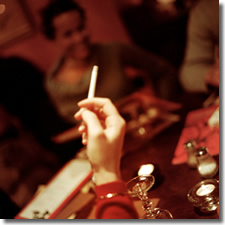 The highest youth exposure to secondhand smoke in public places was found in Buenos Aires, Argentina (86.7 percent). In the United States, 42.1 percent of students were exposed to smoke at home while 69.7 percent were exposed to smoke from others in public places. Despite high prevalence figures, a large majority of young smokers want to quit. Overall, 68.4 percent of students indicated that they wanted to quit smoking immediately. Tianjian, China, had the highest percent of current smokers who wanted to stop at 86.9 percent. About 55.8 percent of American youth, who currently smoke, wanted to quit, somewhat less than the global median. 9.4 percent of smokers smoked six or more cigarettes per day. 28 percent of students thought that boys who smoke have more friends. Nearly 80 percent of students saw ads for cigarettes at sporting and other events. 10.6 percent of students were offered free cigarettes by a tobacco company. 17 percent of students owned an object with a cigarette brand logo. The Centers for Disease Control and Prevention protects people’s health and safety by preventing and controlling diseases and injuries; enhances health decisions by providing credible information on critical health issues; and promotes healthy living through strong partnerships with local, national, and international organizations. More information on CDC’s tobacco control activities can be found at CDC’s Tobacco Information and Prevention Source (TIPS) Web site at http://www.cdc.gov/tobacco/ or call the Office on Smoking and Health press line at 770-488-5493.